Leslie Dalton Roger is in the midst of skinning out a crow as a gift for a friend as we begin our interview in her studio. 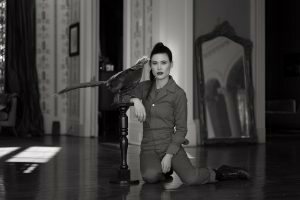 She is a professionally licensed taxidermist from New Orleans. 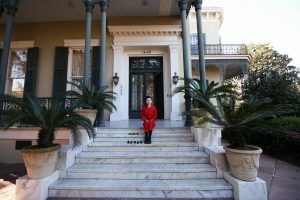 Raised in the French Quarter and Mid-City, Leslie now calls Uptown home. Most of the species that she works with die of either natural causes or through conservation laws (meaning that they are an invasive species that become a danger to certain habitats or other animals). Leslie: My main thing right now, although I do mammals, is working on birds. I’ve been working on birds for the past year. I think it’s really important to focus on one species of animal because then you can become really good at it. Sarah: How did this start for you? 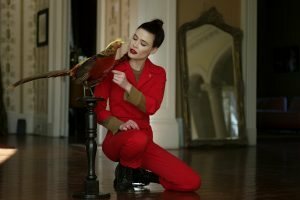 How did you decide to become a taxidermist? LDR: I grew up spending a lot of time outdoors. My family had a cattle ranch in Mississippi. I spent a lot of time outside watching animals, hunting fishing and learning to take care of the land. From an early age, I was exposed to taxidermy and animals in their natural habitat. I collected taxidermy for years and I went to art school. Initially, I went to become a painter, but I got sick of painting because I didn’t like the 2-D aspect of it. I was always more interested in the figure. Leslie expresses that her interest in the figure lead her not only to pursue sculpture and other mediums of similar 3-D nature but also lead her to a deep appreciation and study of the anatomy of animals. She worked for an art gallery after college and had her own studio space. LDR: My work became more about decay, more so about Science and the way things decay and mold, and I found beauty in that. After meeting her husband, Leslie traveled around the world with him. In her travels, Leslie saw many things that inspired her artistically. Upon returning to the US and to work in the studio, Leslie decided to take things a bit further and try out taxidermy. She went to Montana to attend the Advanced Taxidermy Training Center of Northwest Montana. LDR: I looked online for schools and found one in Montana that looked pretty advanced. I went up there for about three months and took courses on mammals and birds. Since then I’ve been doing my thing and getting better at what I’m doing and building clientele. Most of my clients are either designers or artists. I’m lucky I have really interesting clients that constantly push me artistically to do things that I haven’t done before. I constantly have to research. 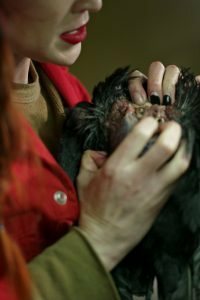 Sarah: How is it for you working with animals that were once alive rather than stone or mediums that were not? LDR: Because the process is so routine to me now, it feels like another material until it’s done. When it’s done I feel like I’ve given it a new life, a new purpose. I don’t see it as this macabre, working with something that’s dead. The only time I’ve ever felt sad working with something was when someone gave me their pet bunny. It just felt different, maybe because I knew in my head that this was somebody’s pet. Leslie expresses that she doesn’t feel the soul or the aura of the animal in the way that one might feel the aura of a person. 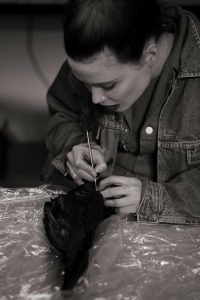 To her, it is a medium until it is finished, at which point the animal is given a second life through the art of her taxidermy. She is more interested in the science and art of creation. Once it is finished, she does feel like it is alive again, in a new sense. 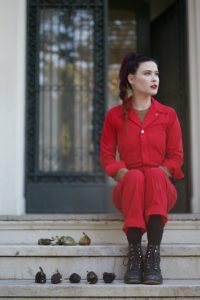 LDR: Death is just a part of the lifecycle. I just get really in the zone here. Most taxidermists, the ones I’ve met, are big animal lovers, as I am myself. That’s typically why I don’t do pets. Another thing that taxidermy taught me is that we are all animals. We are made of the same blood vessels, ligament, bone. Even though we’re so different and our bodies are so different, everything underneath is pretty much the same. Taxidermy is one of those things where you have to do it yourself to really understand how you can look at a dead specimen without getting upset and seeing it as just a dead specimen. Crows are actually illegal to sell. They’re generally not well taken care of once they’re found because they can only be given for free to taxidermists and not sold to them. There are a number of birds that are illegal to mount. Leslie makes it clear that she doesn’t do illegal work. When people ask her to mount owls and other illegal birds that they’ve found that died of natural causes she always says no. Mounting an illegal animal could result in her losing her license and even doing jail time. There are strict laws prohibiting the mounting of endangered animals as well as certain other ones. Sarah: How do you get the animals that you work on? LDR: I get most of my animals across the country from farmers who raise them and have them die. I get some from pet shops. You can actually find some on eBay believe it or not. 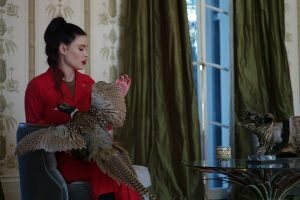 As long as people know that you can make money off of something people will sell things they find in the wild… like a frozen bird through taxidermy.net, to a taxidermist. Leslie goes on to explain that buying online can be risky because it’s hard to tell if what you’ll be getting is going to be of high quality. Her solution to this is to form positive business relationships with a few good sellers that she’s met online. LDR: My peacock guy is based out of Minnesota and if he’s out of peacocks I’ll just wait until he gets another one. I know his peacocks are good quality and that he’s a professional. Sarah: Can you send specimens by mail? LDR: Yeah! They’re shipped frozen and I have them shipped overnight. Sarah: How long does it generally take you to work on a bird? LDR: This one, for example, will take a little longer because it’s frozen. The skin won’t peel off as quickly. I can have a bird like this (crow) done in about one day. The exciting part of my work is when I mount it. That’s when it really comes to life. Sarah: What do you mean by mounting? Is that when you put everything together? LDR: Yes. Once you put the skin over the form, that’s when it starts to get fun. Sarah: What are the steps for a specimen like this one? LDR: The steps are to skin out the bird. Once I have the bird skinned out I put it on the flesh machine. It’s a little steel wired wheel that moves pretty fast. It removes the fat from the skin so that bugs don’t eat it. After that I was it. I wash all the feathers. Then I put it in Chinchilla dust. This separates the feathers and brings them back to life. I put a chemical on the skin that preserves the skin called borax. This is what taxidermists call tanning. The next part is making the form, which is made out of Styrofoam. I wire the legs and the wings and slide the skin over the form. I stick the wires into the form and then I sew it up. After that, I arrange the feathers to make it look good. I paint the eyes and face. Lastly, I position the specimen and decide on a base. Leslie stresses the importance of finishing a specimen within a short period of time. 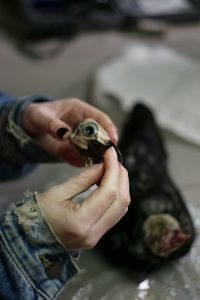 She stresses that you have to be “quick and diligent, but never rush.” Taxidermy is a delicate process, but it deals with skinning dead animals so it’s important to move quickly before the feathers (or fur) start to fall out. It is easy for people to get hurt if they rush since the work involves many sharp blades. Sarah: What’s your favorite piece? LDR: I really enjoy my peacocks because people love the end product. I sort of taught myself how to do them. I took on a client that wanted two peacocks and I’d never done them before. It was a big risk but I did my research and asked the right questions. Taxidermy is a learning process, but the more you do it the better you get. Practice makes better and faster, better and faster. Sarah: Are there any animals that you won’t do? LDR: I don’t really want to do pets, domesticated animals. I won’t do anything illegal, but other than that, no. If I have the right permits, I’ll do pretty much anything. The smaller mammals are really frustrating to work with. I’ve done a few of those. The smaller you get, the more difficult it becomes. Leslie changes her blade many times throughout our conversation. This is because the blade must always be sharp to properly skin the specimen without making holes. 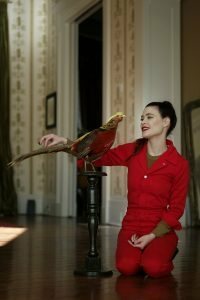 Sarah: Do you see yourself doing taxidermy all your life? LDR: Yeah! I really enjoy it. It’s therapeutic. I look forward to getting even better and maybe one day competing in local, regional, statewide or even worldwide championships. I love taxidermy. If I wasn’t doing this I don’t know what I’d be doing. When I’m not doing it I miss doing it. It can be meditative at times. Leslie explains that getting specimens is about connections and patience. 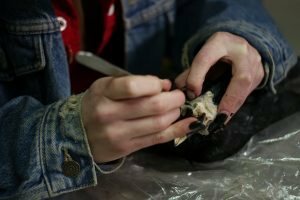 This requires doing the proper research, reaching out and connecting with people around the country who run farms, aviaries and such so that when they have mammals or birds that pass away, they know to call the taxidermist in order to sell them or donate them. 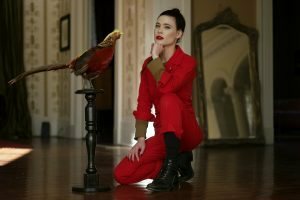 Sarah: Is there a taxidermy community in New Orleans? LDR: There are a few really great taxidermists out here. There is one guy who is based in Hammond who is a really good reptile taxidermist. I hope to meet him one day soon. He just started working on birds and is very good at what he does. To be a good taxidermist you have to be artistic, patient, handy and forgiving- easy on yourself. Sarah: How do you get special permits to work on endangered species? LDR: There are small museums and nature centers that will hire out taxidermists to do work for them, and that’s when you get the special permits to work on endangered species. If I were to ever work on an endangered species I’d be holding my breath the hold time. You don’t get a second chance with those. Leslie explains that sometimes it’s easier to use an artificial head rather than the skull of the animal. The skin from the animal is always used, but with many animals, it is easier to use an artificial head rather than cleaning all of the guts out of the skull. Sarah: Is it easier to work on fresh specimens that just died or frozen specimens? LDR: It’s easier to work on something that’s died recently rather than something frozen. However, it’s important to work on specimens in a timely manner. If the meat starts to rot, the feathers or fur falls out. The specimen has to be skinned before this happens in order to be of use to a taxidermist. Skinning a frozen specimen takes longer, but it is an overall cleaner process- there’s less blood. Sarah: What’s the next step for you as a taxidermist? LDR: To be more creative with the work, to get better at what I’m doing. I want to try new things and try new species of bird. I’m really interested in meeting more people who do what I do so that I can learn from them and network with them. I see becoming a more handy craftsman and entering into competitions in my future. The ultimate goal for a taxidermist is to be a museum quality taxidermist. To work for a museum or to get commissioned for a museum would be the most prestigious commission I could receive. In the meantime, it’s fun to just make artwork out of the specimens and make people happy – make my clients happy. Sarah: Do you have any particular specimens that you want to work on or that you dream of doing? LDR: I want to work more with tropical birds in the future because I think they’re beautiful. I want to work on an alligator. I think reptiles are what’s next for me. Sarah: Do you think that New Orleans offers opportunities to make a good living doing taxidermy? LDR: Oh yeah! I think so. If you wanted to go the route of doing trophy pieces there are plenty of hunters who would happily give you work. You’ve got access to some great wildlife out here. 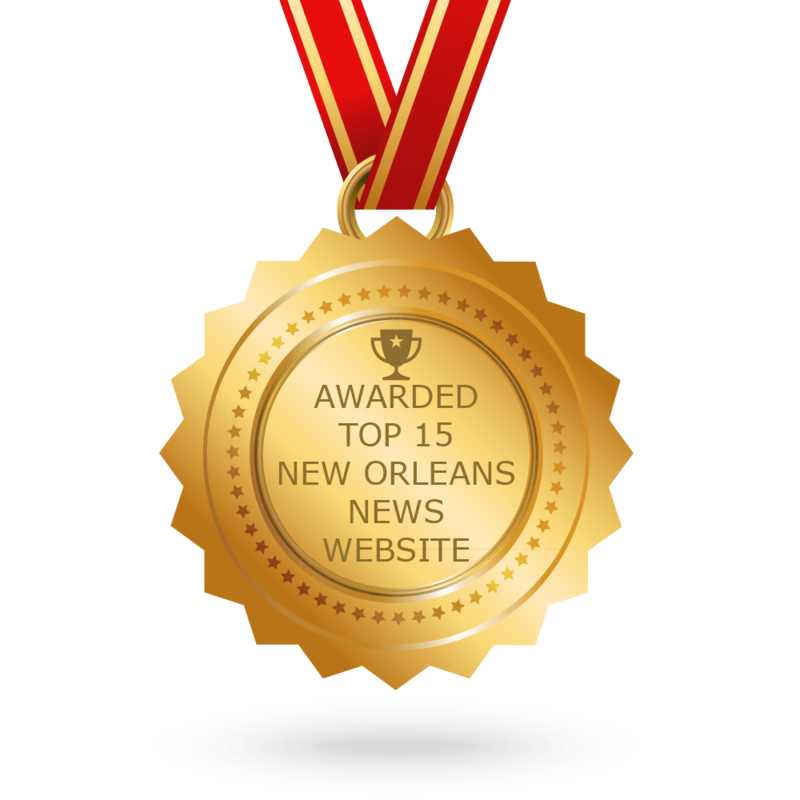 There are plenty of ways to get nationally recognized for what you’re doing. I think this is a great place to be a taxidermist. Sarah: Do you feel inspired by this city? LDR: Yeah! I feel inspired by the wildlife, the tropical climate, the swamps and the history here. I’ve always been a fan of John James Audubon. I find it very inspiring to be living here and doing the work that I’m doing. People are always very interested and intrigued and not in a bad way. LDR: There’s definitely a lot of goths that do taxidermy for sure. That’s definitely not just an idea that you have in your mind. There are a lot of them. I guess I’m a little goth. Sarah: What is a favorite place of yours that you visited in your travels? LDR: I loved Spain. I love France. I have friends in London, some good friends, so it’s always nice to visit there. We went to Barbados. That was nice. I’d love to go to Africa – go on a Safari. I’d love to go to India. I went to Japan. I loved Japan. I’d love to go back to Japan. That was a good trip. I want to go to where my husband is from, Scotland and see his home town. 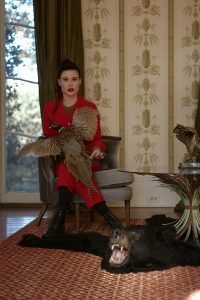 Sarah: You were saying that taxidermy is more present in some countries more so than others. Can you tell me more about that? LDR: Well I think historically it’s very European. The Brits definitely do a lot of it. They’ve always been big hunters. There are some taxidermists in Norway and some Danish taxidermists who are pretty prominent. There are some in Korea who are really good as well. Sarah: Are there any animals that are impossible to stuff? LDR: Not to my knowledge, no. You can stuff pretty much anything as long as it’s not endangered. Sarah: What about fish, can you stuff a fish? LDR: Usually when you see a fish it’s a reproduction. Very rarely is the skin of the fish used. It’s a different process. There’s much more painting and sculpting. Sarah: How long does Taxidermy last once it’s done? LDR: If it’s well done it should last as long as you live, if not longer. It should last forever so long as it’s taken care of. That’s why you want to do it right so that you can give your clients a lifetime guarantee. As we wrap up our interview, Leslie talks about her future plans for the coming year. She hopes to go mentor with a taxidermy expert in Canada this June. Taxidermy is a global art form. 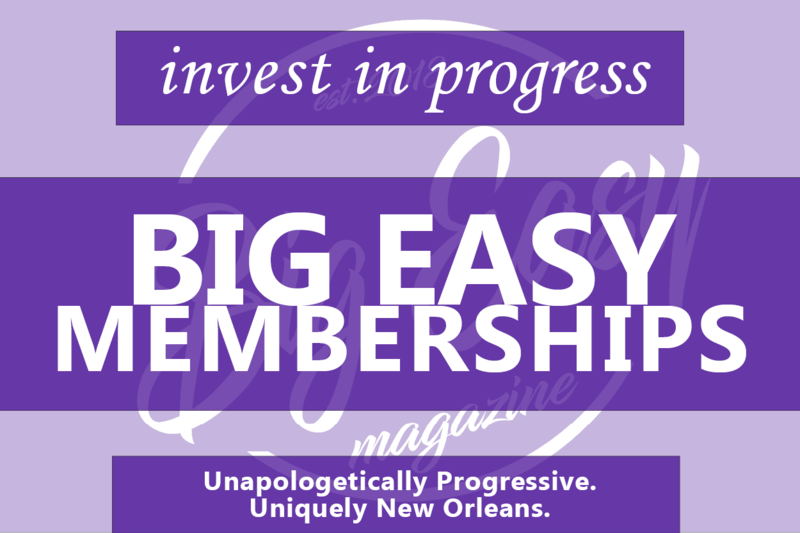 Leslie Dalton Roger takes this art form and gives it New Orleans soul. Her personality and New Orleans history come through in her work. She will do great things in the art world of taxidermy in the years to come to be sure!